Jenn retired as Store Manager to focus on instructing. She instructs in our paddleboard (SUP) and canoe programs. She also teaches Wilderness First Aid for Rocky Mountain Adventure Medicine. She is living her dream! Jenn is graduate of the Bachelor of Eco-Tourism and Outdoor Leadership applied degree program at Mount Royal University, here in Calgary. The program has inspired her love for paddling and the outdoors. 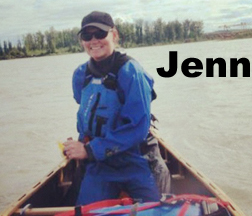 Jenn has embraced the new/old sport of Stand Up Paddling and was the first female instructor ever certified in Canada! She spends as much time SUP’ing as she can! She has paddled all over, including rivers such as the Nahanni, Milk, Bow, the Kananaskis, and the Belize River. Her favourite food is pizza and she worships Dave Matthews Band. “Celebrate we will ’cause life is short but sweet for certain”.